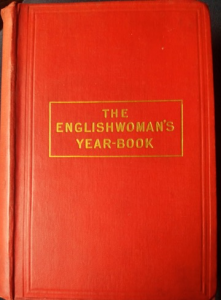 It’s Women’s History Month in the UK, so it seems the right time to draw attention to one of the best overview resources for late 19th and early 20th century women’s history I know: The Englishwoman’s Yearbook and Directory. The EWYB (for short) was a reference manual outlining educational and employment opportunities open to women. Also known as the “Woman’s Whitaker” (after the well-known annual Whitaker’s Almanack), it was published annually by Adam & Charles Black between the early 1880s and 1916. The EWYB offered women who spent 2s 6d on a copy (or borrowed one) an overview of their prospects for improving their situation in life. The volumes began with sections on education and list the universities and university colleges offering classes that were open to women, along with information on fees, courses, staff, and accommodation. One of these institutions was University College Reading. University of Reading came out of the University Extension Movement, a new route for extra-university adult education in the late 19th century. The first University Extension lectures in Reading, a series on the Napoleonic Wars, were delivered in 1885. A newspaper report at the time noted that the series attracted nearly 80 women and “a few gentlemen”. Moving forward to 1892, the extension lectures begun at Reading the previous decade had evolved into “The University Extension College at Reading” as it was listed in the “Universities” section of the Englishwoman’s Year Book. From 1902 it was University College Reading, and offered women the opportunity to take degree examinations with the University of London. Although classics was taught at University College Reading before 1911, in that year a Chair in Classics was established and Percy Ure was appointed the first Professor. And women came to Reading to give formal lectures: in January 1911 archaeologist Evelyn Radford lectured to the Classics department on the sites of ancient Greek games. Over the next decade the number of women reported as working in the Classics Department increased. 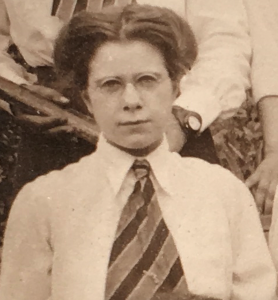 Annie Dunman Hunt, who had studied classics at Reading and obtained with a 2nd class honours degree in 1914, returned to the College in 1916 on a scholarship. Her postgraduate project focused on ancient Greek sites in Ukraine (then called “South Russia”), so she spent her time reading reports from the Russian Archaeological Commission – in Russian. University College Reading women’s rowing team. Photo: Courtesy of Bonnie Ure. Other women students working on Classics-based projects were recorded too. The College had for several years been amassing a collection of antiquities. Two different collections of Roman coins – one from Stanford-in-the-Vale and one from Abingdon – were acquired during the war. Two women, Ethel Scruton and Eileen Craig McGlinchy, were responsible for the initial collection catalogues. By autumn of 1917, conscription continued to strip the College of available men lecturers. The Classics Department’s Research Fellow in Roman Archaeology, Donald Atkinson, was called up. To replace him, two women were hired: Annie Hunt and Katherine McCutcheon, who had been lecturing in Classics at Lady Margaret Hall, one of Oxford’s women’s colleges. That year, Leigh achieved what she called her “heart’s desire” – the lectureship at Reading. Writing about her experience at Reading in later life as a Carmelite nun she describes it as a time when she pushed religion temporarily out of her life. Details on her life at Reading are minimal in her autobiography, but her description of Percy Ure is a sympathetic one: “He was considerate and full of humour, and knew how to give us the benefit of his knowledge and experience without interfering with the details of our work.” A few years into her lectureship, University College Reading’s Annual Report noted that she was granted research leave “to prosecute her studies on the early relations between Brittany and the Celtic communities of the British Isles”. In the early 1920s, another post-graduate student came to the Classics department: Elsie Calam. Her special studies in Romano-British archaeology were funded by the Town of Huddersfield; she had been a student at Huddersfield Technical College during the war. Beyond Annie Hunt (later Annie Ure), who achieved considerable success as an archaeologist and curator, very little information has been published on the experiences of most of these early Reading women. You might notice that more men in this post have weblinks than the women mentioned. * But there is more to find in the archives – this is only the beginning. *Special thanks to the women involved in #WCCWiki for helping me identify first names for some of the women listed here! Bath Chronicle and Weekly Gazette. 1909. The Englishwoman’s Year Book. [British Newspaper Archive], 23 Dec.
Berkshire Chronicle. 1885. Oxford Extension Lectures. [British Newspaper Archive] 27 June. Leigh, M. 1952. The Fruit in the Seed. London: Phoenix House. Waugh, A. 1919. Modernity and Consolation. The Bookman. [British Periodicals] February. University College Reading Annual Reports.